Arcane Archer Pack is a Creation that adds five new arrow types and two new spells. It was released on October 4, 2017 for 150 CC Credits. This Creation adds six new types of magical arrows, all of which can be crafted. Upon installation, you will instantly know how to craft Bone Arrows, Fire Arrows, Ice Arrows, and Lightning Arrows, and will receive five of each. Two quests will also begin, and will need to be completed in order to learn how to craft the remaining two new arrow types. Swift as an Arrow will teach you how to craft and use Telekinesis Arrows, but requires first gaining access to the College of Winterhold. 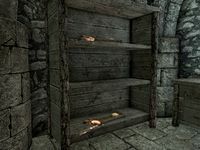 Stealer of Souls will teach you how to craft Soul Stealer Arrows, but requires completion of a high-level challenge in Kagrumez on Solstheim. This Creation received an update in December 2018 which increased the damage of Telekinesis Arrows from 10 to 30 and fixed the elemental damage caused by elemental arrows. This page was last modified on 13 March 2019, at 20:54.